One of the things that has come to annoy me on my Real Food Journey is kids’ menus. Whenever I go to a restaurant, I find the same few things on the kids’ menus. There are hot dogs, hamburgers, chicken nuggets and macaroni and cheese. We all know that these items are highly processed and full of all kinds of junk ingredients. There usually is not a vegetable in sight. It cracks me up that I can find this same children’s menu at any type of restaurant. American cuisine, Chinese, Mexican food…………you name it……it’s the same menu. What I want to know is when and who decided that these items are the only things kids will eat. Don’t get me wrong……I’m not saying that kids love elaborate dishes with lots of exotic ingredients. I get it. I have 4 kids. I know they like what they like and it is hard to convince them to try new things. However, I think a lot of us short change our kids by not exposing them to a variety of fruits, vegetables and whole grains. My oldest and 3rd born both like a big variety of foods. My 2nd and 4th born like lots of healthy foods, but have more of a limited palate and less of a sense of adventure. Not all kids are the same. We all have to do what is best for our children. So why are all of the menus the same? I would love to see children’s menus eliminated or at the least changed. Children do have opinions about food, but I’ve found it is more about the presentation than the food itself. Kids love anything they can pick up with their fingers, bite-size pieces, and smaller portions. They also like fun packages and props or toys with their food. Fast food has definitely figured this out. Think chicken nugget happy meals with a toy. Think fun shaped-breakfast cereal with a hidden toy in the box. There is not an overly long list of ingredients in the Jif peanut butter, but clearly it has added sugar, oil and salt. Natural and Organic peanut butters you can find contain one ingredient. Ground peanuts. Natural peanut butter is different in that the oils separate out of the peanut butter. The oil needs to be stirred in before using. It is really no big deal, but takes some getting used to. Natural peanut butter should also be stored in the refrigerator to preserve freshness. from many children. The good news is that there are a wide array of nut butters and sun butter that can be used in the same way as peanut butter. 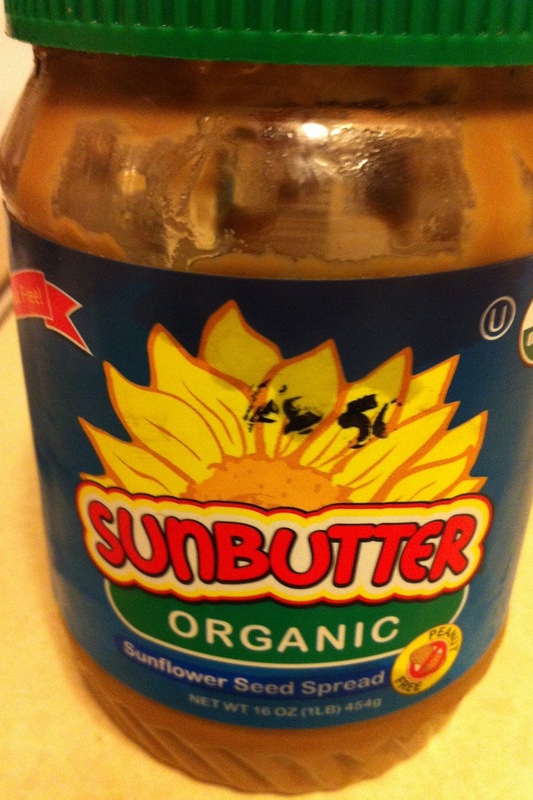 I was first introduced to sun butter when my kids went to a peanut free pre-school. There I was introduced to a butter made from sunflower seeds. My kids didn’t have peanut allergies so sun butter was new to us. We soon learned to appreciate its unique flavor. Another plus to this discovery, buckeyes (normally made with peanut butter) can be converted to a peanut free alternative. Perfect for my sister who does have a peanut allergy. 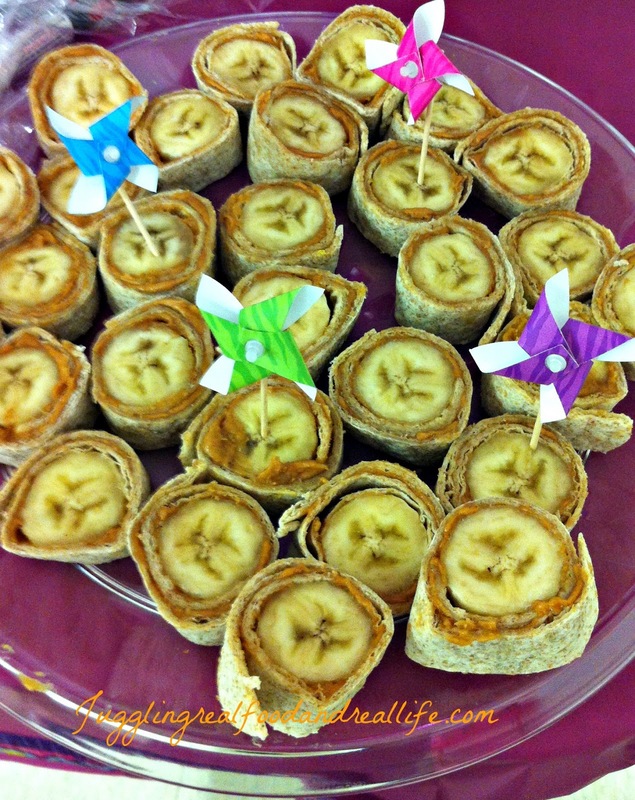 Keeping in mind that kids love finger food and simple combinations of food, I introduced Monkey Bites to my kids. They loved them! They ask for them all of the time for lunch, breakfast, snacks, and now even for birthday parties. They are super simple to make and because of that I often have the kids help to make these for themselves. I hope you enjoy them as much as we do. 1. Lay whole wheat wrap flat on counter. 3. Place whole peeled banana on the edge of the wrap. 5. Cut off ends and then slice into approximately 1 – inch pieces. 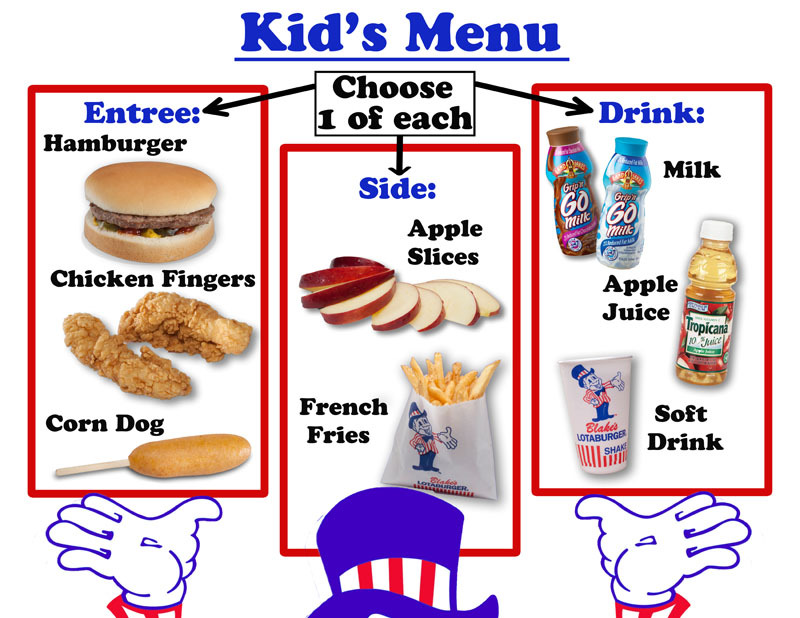 What do you think of children’s menus? 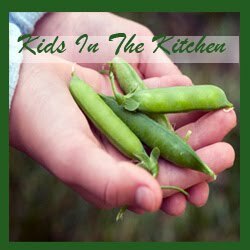 Do you think all kids are picky? What would you like to see on a children’s menu? Have you tried natural peanut butter yet? Do any of you have peanut allergies? So many questions…………so little time. Thanks for stopping by. I look forward to all of your comments. Your comments make all this writing worth it. Hi, found you on the Monday Mingle. I really like your site. I completely agree with the lack of choice for children in restaurants – it's pretty much the same deal in the UK. The Monkey Bites look great – going to the supermarket in a few minutes and may just grab some tortilla wraps while I'm there – I'll let you know what my kids think! Thanks for stopping by Serena. I would love for you to stop by often and provide your UK perspective. I'll be by to check you out. I hope you circle back and let me know how you like those Monkey Bites. I think I like them as much as the kids. I do like the addition of apples and I've seen cucumbers some places. Small changes like that make me happy. My kids almost feel like it's wrong to eat off the adult menu. They crack me up. I always share my salad with them since their meals don't come with salad. Of course, we try to avoid eating out on a regular basis, but that is not always possible. Thanks for stopping by. 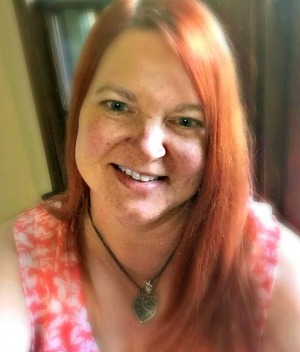 Thanks for linking up with the Write Mama blog hop! We have eliminated restaurants in general. We tend to go to Tropical Smoothie and Earth Fare (yep the grocery store). They both offer great options for kids! I have made something similar to your rolls so can attest to the fact that they are awesome! Hi Heather! I hear Earth Fare is great. We don't have those where I live. I wish they were. I try to avoid eating out, but sometimes you just have to. Non-smoking section? How about a non-processed food section. That's what I would like to see. kids menu's are just terrible! and you hit the nail on the head, they really are all the same no matter where you go. i am trying to broaden my toddlers culinary palate, not continue to feed her mac n cheese, burgers and chicken tenders. Hi Amanda! It's like these restaurants are brain-washing us and our kids into thinking kids only like a few foods. Crazy! Sounds like you are doing a great job with your daughter. She will grow up liking a wide variety of foods. Let me know what you think about the Monkey Bites. I dont have little kids but the kid in me might like those monkey bites.! LOL. Thanks for following me Via Facebook! Have a wonderful week! Don't worry Lisa, I eat them as much or more as the kids do. Peanut butter and bannana………Yum! Kids' menus drive me crazy. My kids never ate that stuff at home. Why would restaurants think they want to eat it elsewhere? We usually would order something off the regular menu for them to share or make substitutions with veggies and soup. As my kids got older, even they were annoyed by the choices they were being offered! Carrie that is a great story. I know my oldest who has always been a bit of a foodie was always annoyed that the adults were eating crab legs and he was offered hot dogs and hamburgers. We were just at a steak restaurant and the side dishes offered with the macaroni and cheese were french fries or rice. Really? No vegetable or fruit? My little guy ordered oranges. Too bad they didn't have any.